Children in the Amhara Region (April 2012) - one of Ethiopia's most picturesque but also most impoverished areas. In this blog post, Amboka Wameyo, Gebriel Galatis and the EDA team travel back to Addis Ababa from their visit to the Amhara highlands. 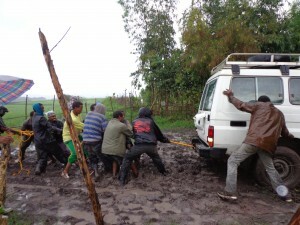 It’s the rainy season in Ethiopia – which is good news for farmers, but makes for some transportation challenges even in suburban communities just outside Ethiopia’s capital, where infrastructure like roads and services decline quite substantially from the relatively better-equipped urban centre not 40 km away. Sounds like Amboka and the team had quite the adventure trying to visit, among other projects, the borehole (well) in Gelan Idero – one of the pilot villages in CFTC’s new “Sponsor A Village” program. Ethiopian tenacity, resourcefulness and hospitality to the rescue … ! Amhara Region standard road traffic. August 29, 2012, Debre Berhan, Ethiopia–We left the Mountain of Light (Debre Berhan) for the scenic downhill drive to Addis Ababa for the final part of our visit with CFTC partner, Emmanuel Development Agency (EDA). The road from Debre Berhan to Addis Ababa is tarmac all the way but is used just as much by domestic animals as by cars. 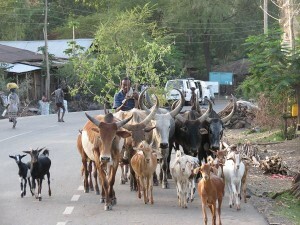 We met donkeys carrying heavy loads, cattle heading to different places, horses, sheep…all the animals you can think of. And here on this tarmac, cars do not have the right of way! An accident that kills any of these animals could result in substantial fines from owners and community members. 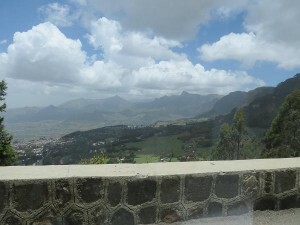 Spectacular views on the drive to Addis from the Amhara Region. The journey was therefore undertaken slowly and carefully but we were not complaining — after all, the views are spectacular. However, we had to drive slowly for other reasons too. Ethiopia’s Prime Minister recently passed away and was buried Sunday, September 2nd. Not everyone was able to go to Addis Ababa for the funeral. So, communities organized mourning processions and we met many of them as we drove to Addis Ababa. While death can be depressing, it also creates an opportunity for those who remain behind to reflect. The mourning processions included chants and reflections on the life and times of Prime Minister Meles Zenawi. Ethiopians are talking about some of the positive things that have happened during the Prime Minister’s reign while at the same time mourning him. The challenge now is to build on the positives and continue to work towards an Ethiopia on track to achieve six of the eight Millennium Development Goals and where children are free from poverty. We did finally get into Addis Ababa, and did make it to Akaki-Kaliti sub-city — one of Addis Ababa’s ten sub-cities. While the drive from Debre Berhan to Addis was slow, in Akaki-Kaliti sub-city where the tarmac comes to an end, our journey ground to a complete halt. We were stuck ‘wheel deep’ in wet, deadly, black cotton soil. The slippery soil was thoroughly disrespectful to our four-wheel drive vehicle! In the end, a group of young men came to our aid using an orange rope (CFTC’s colour of course! ), sticks, logs, hoes, stones, brute force and lots of singing to pull us out. In good times and bad, singing can’t be beat. And so ends my fourth day in Ethiopia.